Saint Abibus of Nekresi was one of the Thirteen Syrian Fathers who arrived in Georgia in the 6th century under the leadership of St. John of Zedazeni. With the blessing of his instructor, St. Abibus began his apostolic activity in Nekresi, a village set among the hills in the eastern region of Kakheti. For his virtuous deeds, St. Abibus was soon consecrated bishop of his diocese. According to the chronicle Life of Kartli, St. Abibus converted not only Georgians but also most of the mountain tribes—including the Dagestani/Didoians—to the Christian Faith. Abounding with apostolic zeal, St. Abibus journeyed throughout the villages of his diocese, preaching the Truth and calling upon all to strengthen the true Faith. The time that St. Abibus was serving as bishop coincided with a dark period of Persian rule in eastern Georgia. The Persians exerted every effort to implant their faith—the worship of fire—and everywhere erected altars where the fire burned without ceasing. Once in the village of Rekhi the holy hierarch, finding a group of fire-worshipers forcing the Georgian faithful to worship the flame, poured water on their fire to extinguish it. The enraged pagan priests bound St. Abibus, beat him cruelly, locked him up, and reported the incident to the marzban. The marzban ordered that the bishop be brought to him at once. St. Abibus was a friend of the holy wonderworker Simeon the Stylite of the Wonderful Mountain. St. Simeon received a sign from God of the imminent martyrdom of St. Abibus and, in order to console him, sent him a letter, an evlogia (a blessing—probably a piece of prosphoron or some other holy object) and a staff. While Abibus was being escorted to the marzban, in the village of Ialdo he met a messenger from Antioch who presented him with St. Simeon’s gifts. 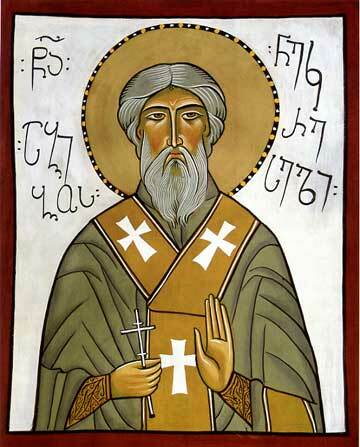 The letter and gifts gladdened the holy hierarch and strengthened him for his martyrdom. Then St. Abibus was approached by a group of Christians who offered to help him escape, but he graciously declined. Having arrived in Mtskheta, the saint prayed at Svetitskhoveli Cathedral, then requested that the guards permit him to meet with St. Shio of Mgvime. The Persians granted his request, and the spiritual brothers greeted one another with love and prayed together to the Lord. Many miraculous healings have taken place over the grave of St. Abibus. During the rule of Prince Stepanoz of Kartli, the incorrupt relics of St. Abibus were translated from Samtavisi to Samtavro Monastery in Mtskheta, according to the decree of Catholicos Tabori. They were buried under the holy altar at Samtavro Church.